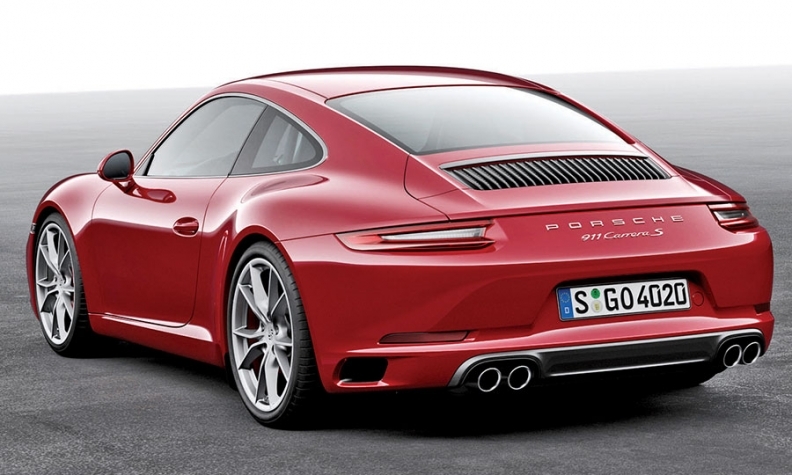 In a first for the nameplate, the 2017 Porsche 911 will come standard with a twin-turbocharged engine. When Porsche's re-engineered 911 hits the U.S. next spring, it will bury another feature in the nameplate's graveyard of outdated technology. The 2017 Carrera and Carrera S will come standard with a twin-turbocharged engine for the first time in the icon's 52-year history. While Porsche is playing up the performance benefits of turbocharging, the switch is an unmistakable nod to rising emissions standards around the globe. "With this car, the 911 can be very efficient and keep its core value of performance alive," said Detlev von Platen, who became Porsche's global sales and marketing leader last week as part of a management shakeup at Volkswagen AG related to the company's diesel-emissions scandal. The 2017 models are known internally (and to Porsche aficionados) as the 991.2. In addition to the significant engine modifications, the Carrera and Carrera S get a retuned chassis, a new infotainment system and screen, and minor midlife cosmetic changes inside and out. But the inclusion of turbos will hog the spotlight on this updated generation. The move means that except for continuing to use naturally aspirated engines in some high-performance 911 variants such as the GT3, Porsche will inter the technology alongside other bygone features such as air-cooling and hydraulic steering. Purists may cringe at the thought of technologies sapping the character out of one of the longest-standing nameplates in the industry. But turbos have performance benefits, too. Porsche's new engines promise to deliver more horsepower and a wider band of torque. Length 177.1 in. 176.8 in. Width 71.2 in. 71.2 in. Height 51.3 in. 51.3 in. Curb weight 3,153 lbs. 3,042 lbs. EPA mpg N/A 19 city/27 hwy. "Porsche has a huge heritage thing and is really famous for their naturally aspirated engines," Pavan Potluri, senior powertrain analyst for IHS Automotive, told Automotive News in Frankfurt. "But they are pretty much at the limit to achieving what they can with these engines. In terms of performance, this is actually better for consumers." Better because the new engines promise not only more horsepower but also more torque -- and a wider band of it to boot. The base 991 and the S now use a 3.0-liter, twin-turbocharged flat six-cylinder engine. This replaces the naturally aspirated 3.4-liter six-cylinder engine in the base 991 and the 3.8-liter six-cylinder engine in the Carrera S.
The base model now has 370 hp and 331 pounds-feet of torque, up from 350 hp and 287 pounds-feet of torque. The 0-to-60 mph time drops to 4.2 seconds from 4.4 seconds on cars with the PDK dual-clutch automatic transmission. While the Carrera S uses the same engine, it draws more power courtesy of extra boost pressure, recalibrated software and larger turbo impellers. The S now has 420 hp, up from 400, and 368 pounds-feet of torque, up from 325. Its 0-to-60 time drops to 3.9 seconds, from 4.1. The seven-speed manual and PDK dual-clutch automatic transmissions carry over. The updated 911 goes on sale in the U.S. in March with a base price of $90,395, including shipping. That's about 6 percent more than the outgoing 911, von Platen said, but that includes the improved technology. "It's a very competitive position," he said. He expects U.S. volume to be stable compared with the outgoing 911. Using turbos is as necessary as it was inevitable. Performance brands such as McLaren, Ferrari and Mercedes-Benz have turned to turbos on their nonsupercar nameplates, and Porsche has to keep up. "Brands like Mercedes are running away from Porsche in terms of efficiency and performance," Potluri said. Porsche's re-engineered 911 goes on sale in March. A hot-lap session around the Hockenheimring, a racetrack in Germany's Rhine Valley, in the passenger seat of an early 991.2 prototype revealed that the updated car retains much of its throttle response as well as the unmistakable rasp of Porsche's flat-six engines. That sound is important to 911 fans. Von Platen said, "What is important is that we keep the fascination around the engines alive in terms of sound, in terms of acceleration, and make this car ready for the future."